In 4-quart Dutch oven, cook beef and onion over medium-high heat 5 to 7 minutes, stirring occasionally, until beef is brown; drain. Stir in hot water, Sauce Mix, basil, salt, pepper and garlic. Heat to boiling, stirring constantly. Reduce heat. Cover; simmer 10 minutes, stirring occasionally. Stir in uncooked Pasta, mushrooms and wine. Cover; cook 10 minutes longer. Stir in parsley. A Dutch oven is a large pot or kettle with a rounded lid that usually holds at least 3 1/2 quarts of liquid. It’s shorter than a stockpot and smaller in diameter, too. 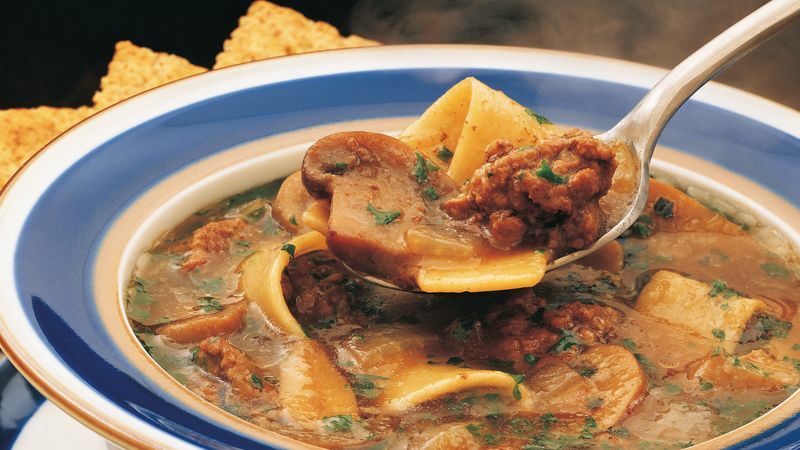 If your family loves mushrooms, add two cans instead of just one.